Nebraska-based startup, Ink, is taking a new approach to on-campus printing that leverages kiosks and a cloud-based interface that’s introducing new levels of flexibility to student printing. According to a TechCrunch report, the company recently raised $7 million from VTF Capital, SQN Venture Partners, Invest Nebraska and NE Angeles, bringing total funding for the company to $15 million. Ink is rethinking the traditional print station that typically sees students log into a terminal or desktop computer to pay and select a print job. These legacy setups work, but rarely make printing from a personal laptop a straightforward prospect. In these instances, students routinely email the document to themselves, use a flash drive or upload it to the printer’s website. SmartStation kiosk at the University of Nebraska-Lincoln. Ink’s answer starts with the SmartStation — a kiosk that features a large touch screen — that connects exclusively to printer hardware from partner company, HP. To print, students first tap or swipe their campus card to authenticate their account. Then, the student can access their Dropbox, Google Drive, or a similar cloud service to select the document they want to print. In addition to basic printing, the SmartStation supports document scanning and can display documents directly on the touch screen where students can digitally sign with a finger. Students can also email documents directly to a recipient, as well as edit and print photos. Students can also wirelessly use Apple AirPrint if they’re running a new version of iOS or MacOS. One of the early campuses to leverage Ink’s offering is the University of Nebraska-Lincoln, where the startup helped to replace print labs and network-based print ecosystem of Pharos Uniprint and Xerox printers. The system at Nebraska deployed a SmartStation kiosk where students can print, scan, copy, fax, digitally sign documents, send mail and print photos. Students can send print jobs to the SmartStation units from anywhere on campus, enabling them to time their printing with their commute to or between classes. 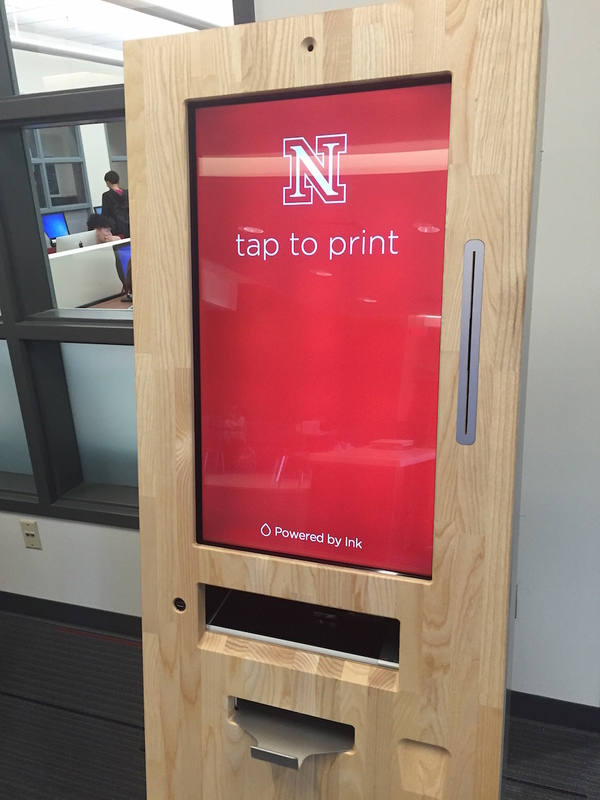 Five additional kiosks have been deployed across Nebraska’s City Campus, primarily in residence halls, since the system went live in 2015. Two of the new kiosks have been moved outside of their respective computer lab spaces to provide 24/7 accessibility. The Ink system features two pricing models. Campuses can either deploy machines for free and charge students a $.09 per-page fee, or a leasing option is available that enables the institution to handle student payment policies. In addition to Nebraska-Lincoln, Ink printing solutions are expected to be on 30 college campuses by year’s end 2017, including Stanford, UCLA, SUNY and the University of Memphis.